This is perhaps the most cited book in the world. I have seen it cited even when there is no need to do so, because the aura of quoting Tocqueville, the 19th century French aristocrat is irresistible. With his magnum opus Democracy in America, written after his visit to America in the 1830s’, Tocqueville entered the hall of immortals and this book is widely considered both by liberals and conservatives as an authoritative book on American history. While there is deep questioning in America regarding democracy and its efficacy and study after study showing that components that build democracy are in decline, this book is a peek into the past that offers us rich insights and lessons. “Amongst the novel objects that attracted my attention during my stay in the United States, nothing struck me more forcibly than the general equality of conditions.” These are the words with which Tocqueville begins his book. Here, he is talking about the equality that he saw among ‘free White men’, of his era, given that slavery was still very much part of the American social makeup. One can forgive him for this and look at the where he is coming from – the nobility of France, a deeply hierarchical society. This is one of the most significant takeaways from this book. This insight into the equality of Americans is also one of the most insightful observations that he makes. While inequality in America did exist in his time and it seems to have only increased in our times, the absence of aristocracy and a perception of equality among all people is part of the psychological makeup that is hard to find in any other part of the world. He goes on to say “The more I advanced in the study of American society, the more I perceived that the equality of conditions is the fundamental fact from which all others seem to be derived, and the central point at which all my observations constantly terminated.” This goes to elaborate his earlier statement about the equality of conditions in America. He did note that the paradoxes in America were quite obvious. Racism while proclaiming equality. A great sense of individualism and the presence of conformist ideas alongside, a deeply religious society that was also extremely materialistic. The sense of local governance and direct democracy that Tocqueville witnessed in his travels across the states was something he marveled at, while there was a Constitution that was over 50 years old at that time. He made a careful note of all these paradoxes and analyzes them. The key problem that he wanted to solve, by writing this book is how democracy could survive and thrive, without falling to the changing mores of a majoritarian agenda. He felt this could be the antidote for France, with its hierarchical society. Having emerged from the French revolution only a generation ago, France then was in clear danger of falling back to autocratic leanings. Not only France, but the whole world could learn from America’s experience, he wrote. He also undertakes a careful review of the judicial system of America, as it forms the backbone of the democratic system. 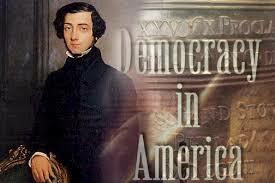 “The courts correct the aberrations of democracy,” Tocqueville points out. He gives a detailed breakdown of how the local courts are aligned with the courts higher up and those are in turn responsible for the national jurisdiction. The system of checks on the Executive branch of government through the judiciary is made amply clear through his analysis. Probing into why Americans thought of each other as equals, he writes “It may safely be advanced, that on leaving the mother country the emigrants had in general no notion of superiority over one another. The happy and the powerful do not go into exile, and there are no surer guarantees of equality among men than poverty and misfortune. It happened, however, on several occasions, that persons of rank were driven to America by political and religious quarrels.” The immigrants who made America their home were in exile, often fleeing religious persecution. This, combined with the English language and customs made them tolerate each other. The Founders, in particular Thomas Jefferson personified this notion of equality in all forms – including enshrining it in the constitution as the First Amendment, that sought to restrict the establishment of any one religion and also barring the state from prohibiting the practice of any particular religion. The wisdom of this basic clause cannot be overstated. When many countries around the world are grappling with issues of secularism, separation of religion and state and the role of the ‘state religion’, such problems are present to a much lesser degree in the U.S. than anywhere else. While it is hard to distill all the key points that Tocqueville made in a short essay, suffice it to say that this book deserves to be read, as it provides us a glimpse into the soul of America of the 19th century. A comparison with that era and our times can offer us benchmark of sorts. As a student of philanthropy, I was intrigued to learn of the history of civil society organizations. Americans are constantly forming self-help groups or some sorts of associations, Tocqueville pointed out. This trend seems to have continued, as we see the nonprofit and civil society sector to be one of the most vibrant in America. Americans given about $300 billion, as individuals to charity every year. Of this, about $100 billion goes to religious institutions, further demonstrating the importance of religion in the American public imagination. This is shifting slowly, but despite the demographic shifts, decreasing influence of Church on individual and societal morality, there is still a general understanding that religious institutions are key to American social life. As America is changing and its fundamental values are being questioned by various discourses related to immigration, wealth inequality, gender relations etc. this book offers us some insights into how America has dealt with these issues in the past and what wisdom this holds for the future. Despite its formidable size, at over 800 pages, this is a book worth your time and attention. Previous Previous post: Should we all be Cosmopolitans Now? Next Next post: Should We Get Rid Of The ‘Southern Mystique’?